We had decided to start our 3 day road trip in Pisa. Arriving at lunchtime one glorious Wednesday we collected our hire car pick and made our way to Pisa itself. We had intended to go directly to the Leaning Tower but difficulties translating road signs and poor map reading on my behalf meant that we ended up driving through the centre of town. And what a beautiful historic town it is with a meandering river dissecting its heart adorned on either side by lots of historic, tall Tuscan style buildings. Unfortunately we didn’t have time to stop and we eventually made it to the Tower parking. The Tower itself leans more than we had imagined and we decided there was no way we were going to climb to the top of a building that looks like it could literally fall over at any moment! Nonetheless we spent a good hour wandering round the cathedral and grounds making the most of the many infamous Instagram photo opportunities. Having exhausted all the usual variations of photos we made our way back to our car and the journey to our first stop at Villa I Barronci, located in the little town of San Casciano, 25km south of Florence. Upon arrival at this quaint little villa in the Tuscan hills we were warmly greeted by the hotel receptionist who showed us round the hotel and took us to our room. We had a garden entrance room which looked out over the outdoor restaurant, garden and pool. The room itself was lovely with a separate entrance hall housing two large wardrobes and steps down into the main sleeping area which was cosy and clean. There was a large TV, a safe and tea/coffee making facilities in the room, and the adjoining bathroom was huge with a double sink and large shower. Everything was modern and spotlessly clean. The terracotta tiles throughout and marble clad bathroom gave the whole room a very Spanish villa feel to it. As well as the extremely fluffy and overly large bath towels, which I loved, there were separate pool towels and slippers for use around the outdoor pool. And what a pool it was, surrounded by well kept gardens and the most spectacular view over the Tuscan countryside. Sitting above the pool is the outdoor restaurant and bar terrace housing a well stocked bar and great bartender serving drinks all day long. The TV and tea/coffee tray. The double sink in the very spacious and beautifully appointed bathroom. As we were travelling in mid October the sultry summer evenings had all but passed us by so we missed out on dining in the outdoor restaurant which I’m sure would be a real treat, especially with the sun setting over the hills beyond the pool area. Nonetheless our dinner in the hotel restaurant was fabulous, with the restaurant itself making the most of the views with the floor to ceiling glass on all sides. The maitre’d was welcoming and friendly, offering us excellent advice on what to choose from the four course menu. 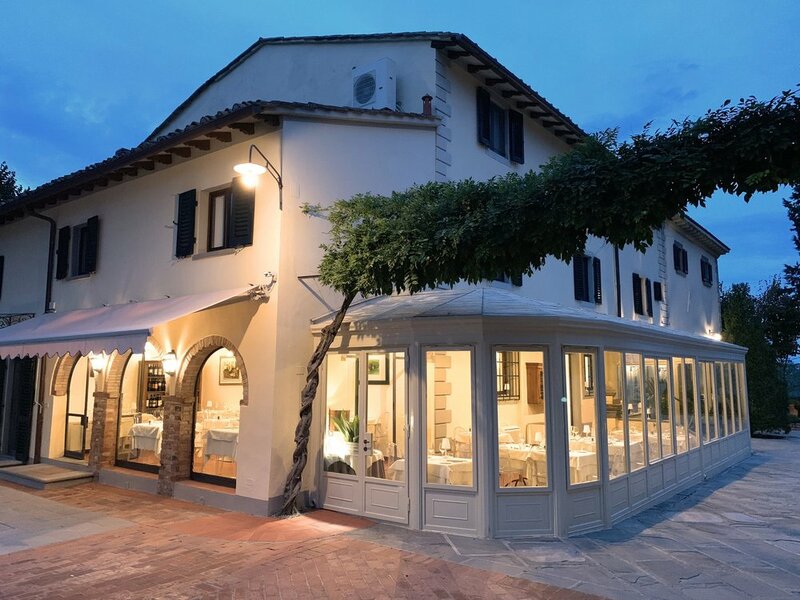 We both started with a traditional pasta dish followed by the most delicious Tuscan beef stew served with grilled vegetables. And tradition dictated that we should savour the local beverage so we accompanied our meal with a bottle of Chianti reserva, spectacularly tasted and decanted by the flamboyant but knowledgable sommelier. To finish we shared a bowl of chocolate and vanilla ice cream topped with espresso coffee before returning to our room (conveniently situated next door to the restaurant) and slept soundly. The unassuming entrance to this gorgeous little hotel. Our room with its own private garden entrance. The main hotel building and restaurant. The next day we woke early to fuel up for a day in Florence. The hotel breakfast was buffet style and included fruit, yoghurt, cereals, fresh pastries, breads, cheeses, meats, frittata, scrambled and boiled eggs, all finished off with the most delicious array of homemade cakes. Fully charged and ready to explore we first stopped off at hotel reception to ask about parking in Florence. The receptionist was extremely helpful and within half an hour we were parked up on the outskirts of Florence without the traumas of the day before, negotiating the tiny streets of ancient Italian cities. The homemade cakes laid out for breakfast. The savoury delights at breakfast. Our first stop was the Palazzo Pitti, the magnificent, large palace south of the river. We didn’t have time to stop here, having been advised that we could spend all day alone walking the palace and it’s magnificent gardens alone. So we made our way over the river on the Ponte Vecchio, an ancient bridge adorned with numerous jewellery stores and views down the river. A little further on we stumbled upon the Piazza Della Signoria flanked on all sides by magnificent marble statues. As we were in Italy it seemed fitting to stop here and take in the views whilst savouring some traditional Italian gelato, banana and coconut for me, coffee and dark chocolate for Rich. The Ponte Vecchio viewed from further down the river. Just a couple of the many statues in the Piazza Della Signoria. 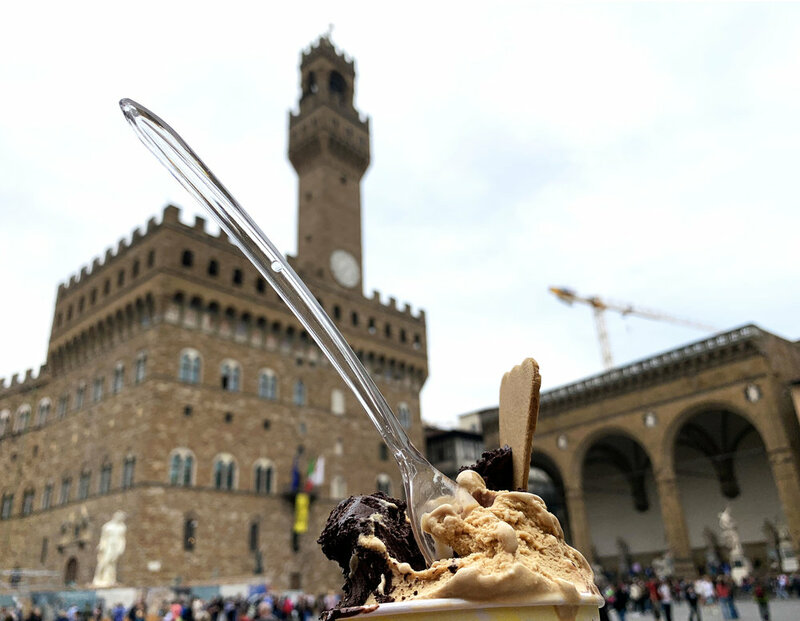 Gelato in the Piazza Della Signoria. 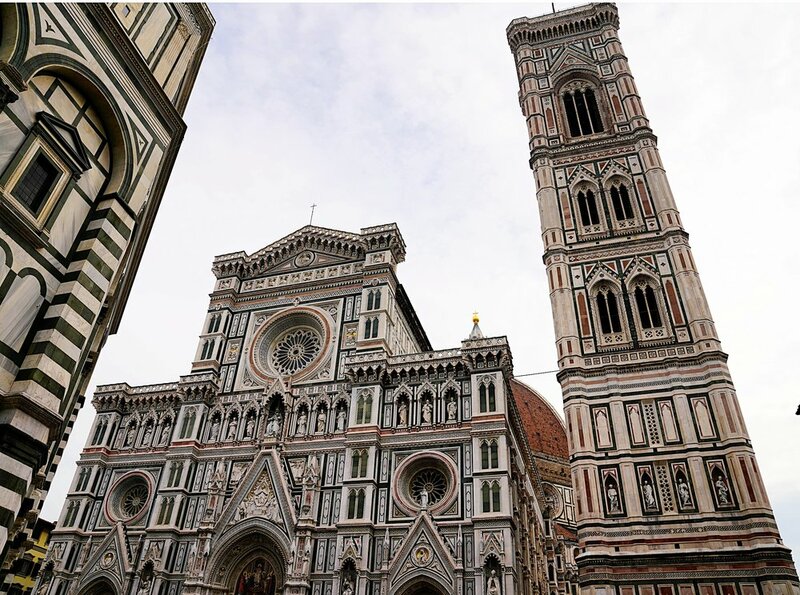 Obviously no visit to Florence is complete without admiring the Cathedrale di Santa Maria del Fiore, and it did not disappoint. Despite the crowds of tourists we were able to stroll all the way around it, taking in the majesty and beauty of this very large and ornate cathedral, baptistery and bell tower. By now lunch was calling and we decided to make our way out of the city centre a little to try to find an authentic pizzeria. We headed down Via Roma the upmarket shopping district passing Jimmy Choo, Gucci, Prada and all of the other usual designer shops. Crossing back over the river behind the Palazzo we stumbled upon a rustic little pizza place called Regina’s where we had the most delicious pizza we’ve both ever eaten. Despite the signs warning of fines, who can resist adding block to this memorial on the Ponte Vecchio bridge. The Bell Tower at the Cathedral di Santa Maria del Fiore. The Duomo and Bell Tower at Florence cathedral. The very ornate entrance to Florence cathedral. Authentic and delicious Italian pizza served in a wooden box! Having walked miles and feeling full and exhausted we made our way back to the car for the journey back to our hotel. A couple of hours rest in the peaceful gardens and it was time to get ready for dinner. We decided to eat in the hotel restaurant again and were not disappointed, enjoying another delicious meal served by the friendly and attentive staff. We really could not recommend this hotel enough and wished we could have stayed here longer! The beautiful view of the pool from the hotel bar terrace. The sun setting behind the hotel and pool. What a view! The outside restaurant and bar terrace which, handily for us, was just outside our room! 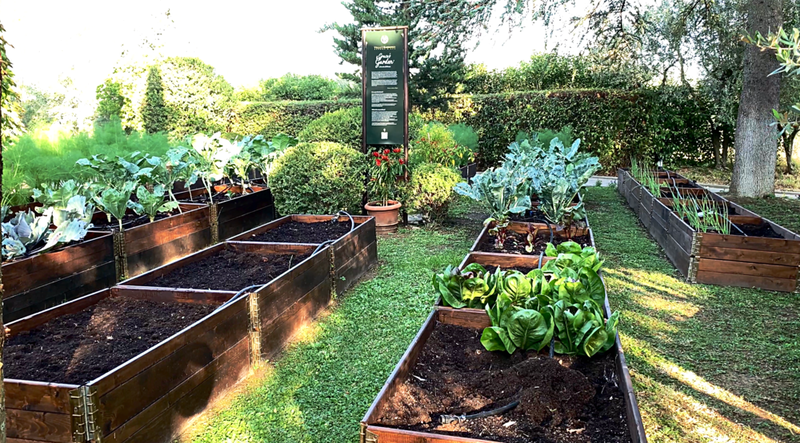 The hotel’s kitchen garden. We savoured some produce from here both nights we ate in the restaurant. The next day we enjoyed a leisurely breakfast before our long car journey down to Civitavecchia via Siena. The hour long drive from our hotel to Siena was all I had imaged our Tuscan road trip to be with the landscape smattered with those infamous tall Tuscan Cypress fir trees, rolling hills and vineyard after vineyard. Approaching Siena by car it was just as wonderful as I had hoped it would be, with glimpses of the city sitting on the hill surrounded by the ancient walls. We drove through an arch in the wall and parked the car. Walking from the car park to the Piazza del Campo along the steep narrow streets over shadowed by the four or five story buildings on either side it is hard to take in how residents of Siena live in these ancient buildings. The narrow, steep streets of Siena. Our interest in Siena was sparked many years ago we were gifted an original painting of the infamous Palio di Siena horse race by one of Richard’s relatives and it has taken pride of place in our living room ever since. So we were immensely excited to be visiting the site of the race, the town square, so we could see the actual stomping ground of the painting we love. And it was magnificent. We chose a coffee shop to sit and take in the surroundings and try to imagine the atmosphere of the 90 second race as the horses gallop around the outside of the square with spectators adorning the staged seating around the edge and filling the middle of the square. Part of me would love to be there to witness the race but another part of me knows I would be terrified for the horses and riders (many of whom get injured) and the risk to the spectators. Our original painting of the Palio di Siena. Siena cathedral and bell tower. Having finished our coffee we made our way to the cathedral which was in many ways more magnificent than the one in Florence, with beautiful marble statues and adornments. After an hour or so wandering the streets of Siena we made our way back to the car (armed with pizza slices for the journey) to continue the last leg of our road trip, a three hour drive to reach Civitavecchia. Having ticked three awesome destinations off of our bucket list we were eager to continue our Mediterranean journey with a 10 day cruise on the Crown Princess! Read about our Mediterranean cruise on the Crown Princess here.